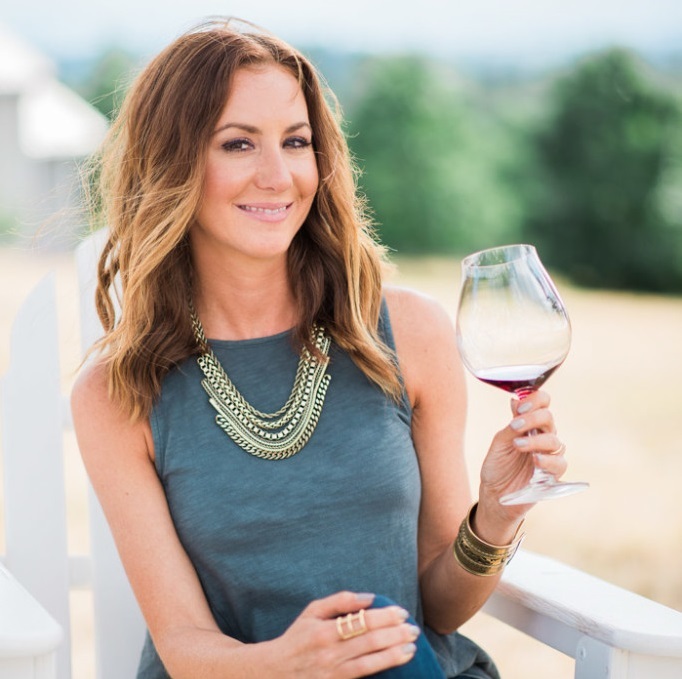 February is here and I’m already googling “When is daylight savings time?” February means we’re just that much closer to spring, and sunshine, and warmer weather – opening up all the windows, letting the fresh breeze in and sipping rosé on the patio. OK – We’re admittedly a ways off from that. But, how about we liven up these remaining rainy days of winter with a bright and beautiful salad? 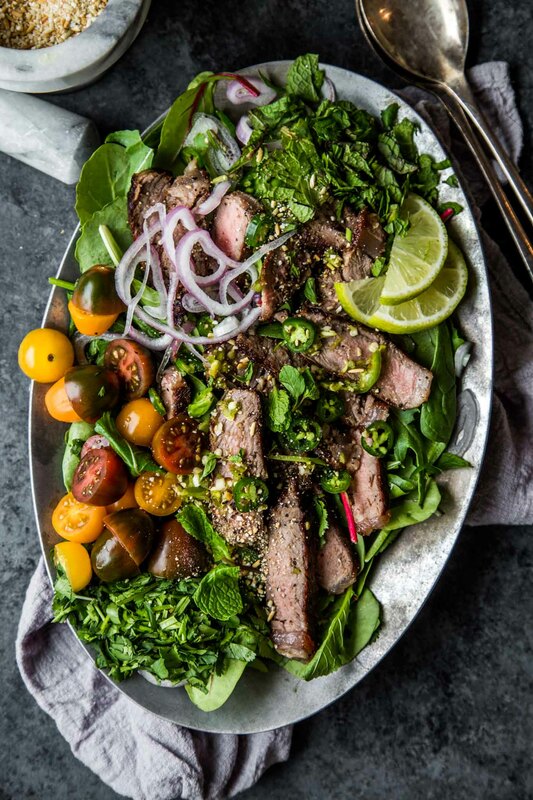 This Thai Beef Salad is loaded with intense, tangy flavors – Citrus, lemongrass, mint and cilantro dance around with a bit of lime juice, spicy jalapenos, and a pinch of brown sugar to lend some sweetness and balance it all out. There’s a couple ingredients in this Thai Beef Salad that you may not be too familiar with. The first is fish sauce – As I warned you before, don’t be scared of the fish sauce – It can smell quite pungent out of the bottle, but once it gets mixed with the other ingredients you won’t even know it’s there. It just gives a nutty, salty, umami characteristic to the dish. That hint of something extra that just takes this salad over the top. Fish sauce has definitely gained popularity over the past decade, I think as more and more people are exploring with cooking asian dishes at home. Because of that, you should be able to find it easily in the international foods aisle of your supermarket. The second somewhat obscure ingredient is the toasted rice powder. I like to think of this rice powder as my Thai alternative to croutons. 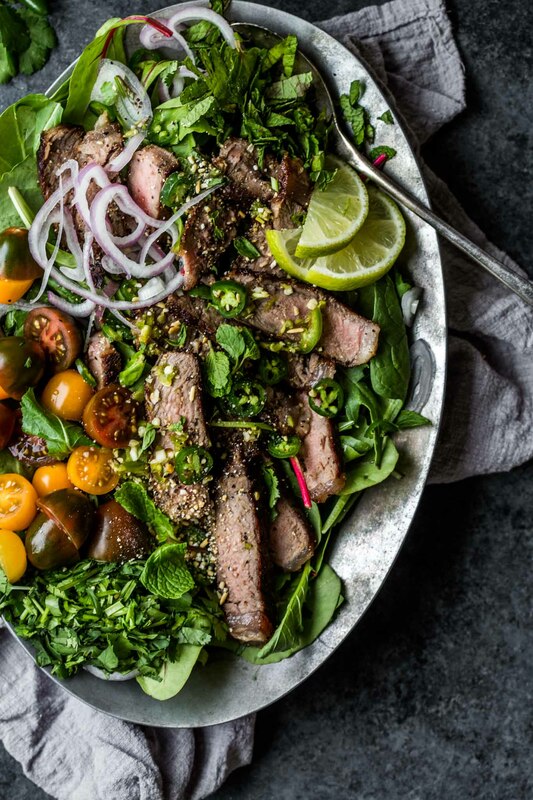 It gives an amazing crunch to the Thai Beef Salad and has a nutty, almost creamy flavor to it. To make it, just toast some white rice grains in a small sauté pan and then grind them up using a mortar and pestle, until the’re about the size of breadcrumbs. You can also use a coffee grinder to get that breadcrumb like texture – Honestly, that’s what I do most often. 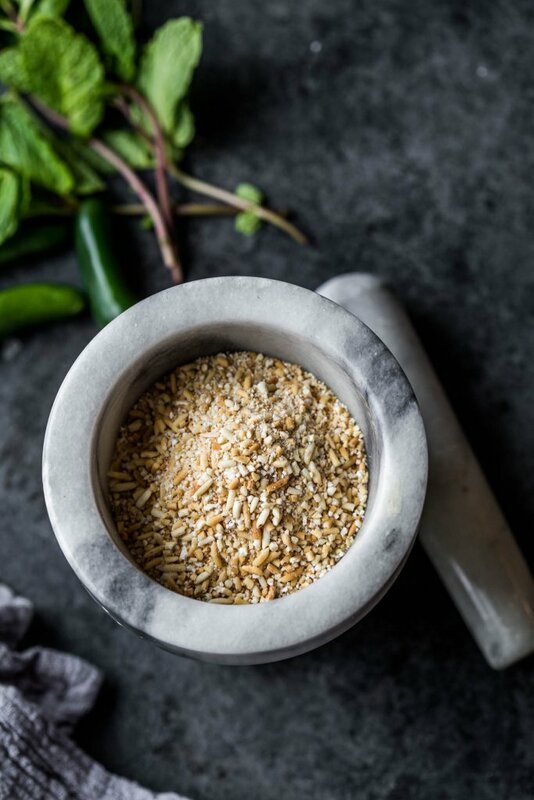 Just be sure to run a batch of rice through there first, before you grind up the rice that you’re actually going to eat – That way you can wipe it clean and be sure that no coffee grounds remain. Tip: This is also a great way to clean your coffee grinder. Regardless of how you prepare it, don’t skip the rice powder, I guarantee it’s worth the extra little bit of effort, and just adds that perfect finishing touch. I’ve also found that the heat level can vary so much from restaurant to restaurant. I like my food spicy, but at some Thai restaurants, medium is like burn-your-face-off hot. Others, you can barely notice the heat. 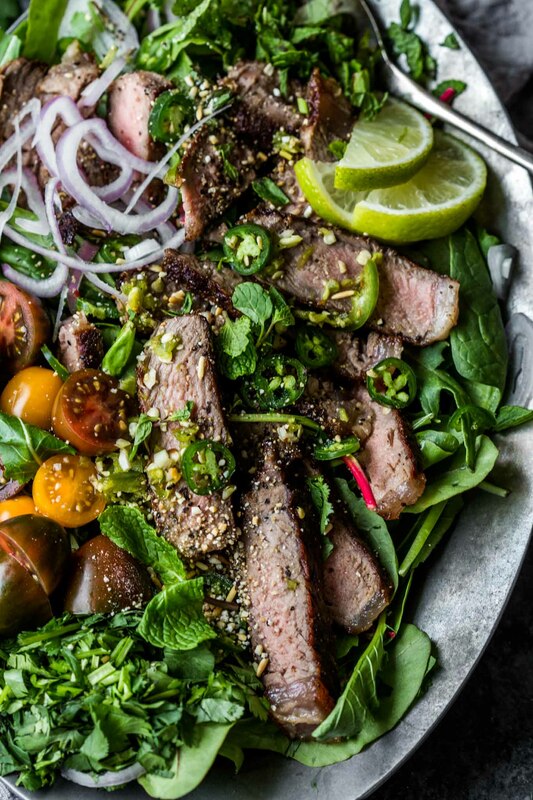 That’s one benefit to making this Thai Beef Salad at home. Taste the dressing as you go and add more or less jalapeno or red pepper flakes to suit your taste. Keep in mind that jalapenos themselves can vary so much in heat depending on factors like the season or their size. And, while you’re tasting for heat, it’s also a great time to add more or lime juice, sugar, or fish sauce. Give it a taste and adjust – you’re looking for the perfect balance of spicy, salty, sweet. Trust me, when you hit that sweet spot, you’ll know! Have you ever ordered this Thai Beef Salad in a restaurant? What was it called? Crying Tiger? Waterfall? Beef Salad? Tell me in the comments below! 30-Minute Thai Beef Salad is tangy, spicy, amazingly delicious yet deceptively easy to make. Topped with toasted rice powder for a bit of crunch. It's a healthy salad that tastes so decadent! 1 1-inch thick New York strip steak 9 to 10 oz. Mince the garlic and one of the chile halves and place in a small bowl. Slice the remaining chile half into thin rings and add it to the bowl, along with the lime juice, fish sauce, lemongrass, brown sugar, and red chile flakes. Taste and adjust seasonings with additional lime juice, fish sauce, sugar, if needed. Stir well and set aside. Put rice in a small frying pan over medium heat. Cook, stirring frequently, until the grains are toasted and golden, about 10 minutes. Let cool for a few minutes and then grind into a coarse powder in a spice grinder or with a mortar and pestle. Heat the oil in a skillet over medium high heat. Sear the steak until it is well browned on one side, 5 to 6 min. Flip and cook until the second side is dark brown and the meat is medium rare, another 5 to 6 min. Transfer to a cutting board and let rest for 5 min. Slice the steak thinly and then cut into bite-size pieces. 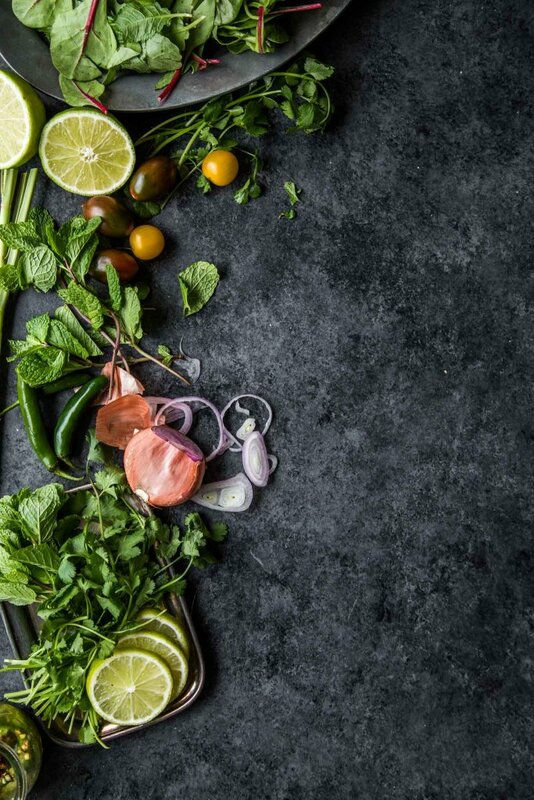 In a medium bowl, combine the beef (and any accumulated juices), shallots, mint, and cilantro. Stir the dressing and pour it on top. Toss gently. Add the ground toasted rice, and toss. If you loved this recipe I would appreciate it so much if you would give it a star review! Also, be sure to snap a picture of your finished dish and share it with me on Instagram using the hashtag #platingsandpairings. Rieslings pair great with spicy dishes. Mouthwatering acidity, intense fruit, and a hint of sweetness compliment this salad amazingly well. A Viogner or dry Rosé would also be great with this dish. Note: This post was originally published in May 2015. It was updated in January 2017 to revise the pictures. The delicious recipe, however, remains the same. Thanks Melissa! I absolutely love thai food as well – And this dressing? My favorite!!! This looks so fresh—and healthy! See, Thai food isn’t all rice noodles! This looks so tasty! I’ve been trying to find new ways to spice up my salads and this is coming at the perfect time. I’ll probably replace the jalapenos with a different pepper (just not my favorite flavor) but I’m definitely pinning this for my shopping trip this weekend. I hope you enjoy Cindy! Cheers! Yumm! That sounds so good and looks beautiful! The fresh lime and garnish are a great touch! I’ve never tried rice powder but it sounds good! I hope you have a chance to try it Suzannah – The rice powder definitely adds some great texture! This salad is gorgeous! I love the styling…. makes me wish grilling season were here already! Thanks so much Caitlin – The good thing is that you can make this on your stove top, although a grilled steak would be amazing as well! That plate makes my mouth water! I LOVE thai food an steak salads! I will have to give this a try. The rice powder sounds like a great addition – I love a little crunch on my salad. I hope you enjoy Eva! It’s called Steak Salad where we eat at. I’ve cooked a 5 oz bacon wrapped fillet under the broiler until. Bacon is done. Let it rest. Make salad , slice steak and add to salad and serve with Thai dressing. Very good and easy. That sounds delicious with the bacon wrapped fillets Georgia! This looks delicious! Will it still be good if I omit the jalapeño and some of the peppers? I don’t like spicy food too much. Hi Amanda – Definitely, this will still be delicious and totally flavor packed without the spicy aspect! I cooked my steak a bit rare, but it didn’t hamper the dish in anyway and was a great salad in the end. Thanks a lot for the recipe Erin! So glad you liked it Riley! I love Thai food so much almost forgot about this one. Been to Thailand a few times and they call it Namtok Neua (Nam = water, Tok = falls and Neua = beef) . Not easy to find in Thailand beef is not very common. Saw the same salad with duck (crispy skin on) instead of beef in some fancy restaurants there delicious as well. And I have to agree the toasted rice is a MUST ! Thanks for sharing this recipe Erin did brings me back to Bangkok for a few minutes. So happy to bring back fond memories Pascal – This is one of my favorite salads of all time! 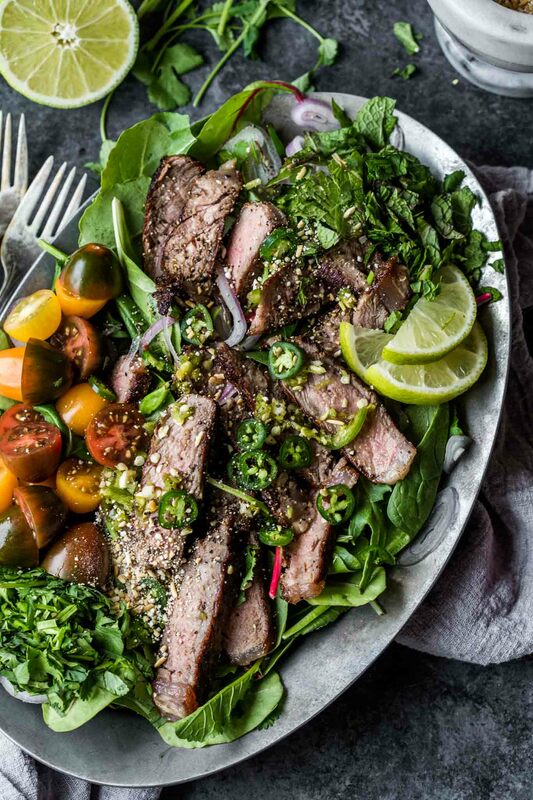 Why does the nutritional stamp say 1 gram of protein when you have steak in this recipe? Hi Christian – It looks like my nutrition calculator was having problems with this one. I adjusted the settings. Looks like there are actually 27g. Hope that helps! I was looking for something to serve as a side dish with a thai curry soup I made. This was so easy and delicious! It stole the show – everyone liked it more than the soup. I made it pretty much as written, no adjustments needed. My only complaint is all the comments that say “this looks good”. I look to the comments to tell me if something is good, and it gives no information if someone thinks it looks like it will be good. It’s really only helpful to comment if you made it and have something to share about it dear people! I’m so happy to hear that everyone liked it! This is my all time favorite recipe!